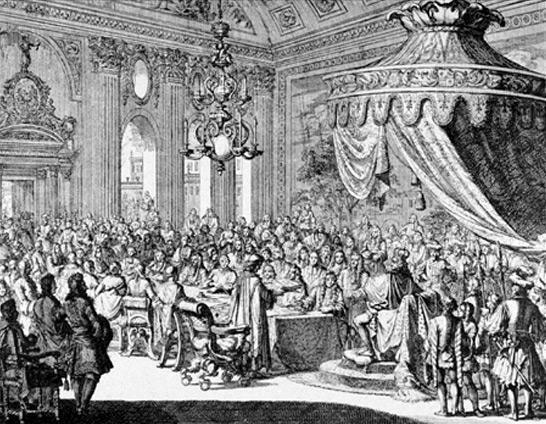 The Revocation of the Edict of Nantes by Louis XIV in 1685 led to the suppression of the Reformed Church in France and forced Protestants into exile or hiding. As a result they lost all social identity. Louis XIV signing the Revocation of the Edict of Nantes in Fontainebleau © S.H.P.F. The Revocation of the Edict of Nantes was preceded by a series of repressive measures against Protestants and the Reformed Church. This anti-Reformation policy of King Louis XIV was trying to bring about religious unity in his kingdom. As this policy was deemed insufficient, the powers that be resorted to force : “dragonnades” and forced lodging of soldiers in Protestant homes, with the freedom to loot and bully. The terrorised Protestants recanted in large numbers. Faced with this situation, Louis XIV revoked the Edict of Nantes with the Edict of Fontainebleau. This new Edict forbade religious practice for the Protestant Reformed Church and stipulated that all their church buildings should be pulled down. Pastors had to recant or go into exile. The faithful lost their identity as Protestants and were declared Catholics. Many chose to emigrate, even though it was forbidden, rather than to submit. The Edict of Fontainebleau aroused violent outbursts : in France, the Catholics approved of it but abroad, the means used to implement it triggered muted disapproval or indignation. The Protestants who remained in France were called the “new converts” and had to comply with Catholic religious practice, that is : attend Mass, have their children baptised and receive Extreme Unction when dying. Many new converts kept on practicing their Reformed religion within their own family circle, in private gatherings or in secret meetings held in the open air or remote areas. When they were caught, repression was harsh : the ones who opposed the ban faced prison or the galley.